Stylish, warm and versatile, the Cressi Fast 7mm Ladies Wetsuit can be used in the widest range of temperate and cold waters. Durable 7 mm, double-lined neoprene, stands up well to compression at depth for maximum heat retention. Pre-shaped legs improve flexibility for easier kicking. Neck with anatomic design, preformed at 120 degrees in the neck area for maximum comfort. New sleeves in double-lined neoprene, and very resistant with a 'Seal' inner ring, to provide tightness. This solution offers great durability. The closure of the wetsuit presents a noticeable improvement of the design that reduces the entry of water at this critical point. The closure flap is now much wider and the nape area is prolonged to prevent infiltration when the neck is tilted underwater. YKK back zip with under zip lining and water-stop system. Anti-abrasion reinforcement on the knees. Knee and shoulder area with Tatex® anti-wear elastic reinforcements. This type of reinforcement does not limit the elasticity of the neoprene, provides sufficient reinforcement and facilitates the positioning of the suit. You can dive during all but the coldest months in southern Australian waters in a 7mm with the correct accessories like gloves and a hood. 7 mm is one of the thickest neoprenes before it becomes too cumbersome and buoyant so they're typically used in colder waters, longer dives or by divers who feel the cold more. Available in sizes 1 to 6. 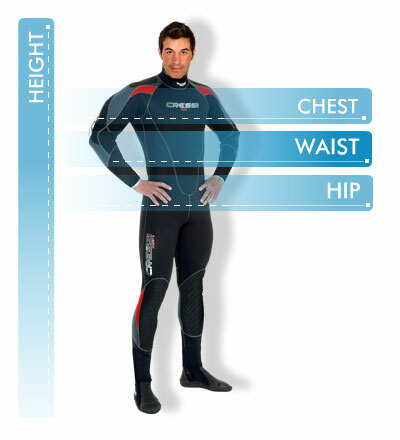 Stylish and warm, the 7 mm Cressi Fast wetsuit is about as versatile as it gets when it comes to thermal protection. The suit's durable double-lined neoprene stands up well to compression at depth for maximum heat retention and comfort. The wetsuit includes ultraspan neoprene on the arms and calves and pre-shaped legs for enhanced flexibility and easier donning and doffing.